Box Notes: Spring has sprung! The golden California poppies have unfurled themselves along the eastern slopes of the Blue Ridge mountain range. The combination of last year’s wildfire and prolonged rain season has created a potent cocktail for vegetative fertility in the wildlands of the region. The Capay Valley is experiencing its own mini super bloom. Check out Bear Valley in May for the incredible wildflower display: http://tuleyome.org/trails/bearvalleyroad/. Spring Hams: Place your order for holiday hams! The whole hams are $11 per lb and average about 8 lbs. The hams come frozen (we can thaw the ham prior to delivery by request) delivered to a CSA drop site or one of the farmers markets we attend (3 in Berkeley and 1 in Sacramento). 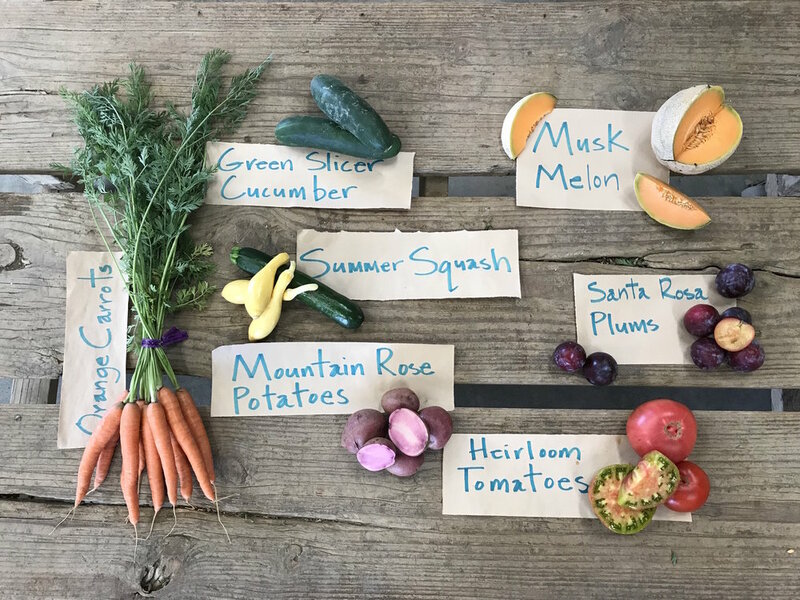 Email the farm at csa@riverdogfarm.com to place your order or visit https://csa.farmigo.com/store/riverdogfarmcsa. The deadline to order for Easter delivery, to be picked up at the Saturday Berkeley Farmer’s Market, is April 18, 2019. For ham deliveries to the CSA drop sites, please place your order by Friday, April 12, 2019. Visit the gardens of the Capay Valley! Come join in the delight of spring flowers, strolling through many of the Valleys’ finest gardens. Talk to the gardeners themselves and learn the secrets of their success. New gardens have been added this year as well as several points of interest along the drive though the valley. Many of the gardens are also showcases for agricultural production in the Capay Valley. You are welcome to picnic in the gardens – delicious box lunches will be for sale at the Guinda Grange Hall using local ingredients. Art and plants will also be for sale at the Grange Hall.